We are delighted to report that KNOM has won the 2003 Crystal Award! It�s among broadcasting�s highest honors. You�ll find details on page 3. As we joyfully celebrate our tenth anniversary in our safe, energy-efficient new building, we continue to thank God for the many kind souls who made its construction possible, including one major contributor who remains anonymous, even to us. Many of these friends are with God now. For everyone who helped out then, and for everyone who helps out now, we continue to pray sincerely and thankfully. May God greatly bless each of you! PASSIN� THROUGH: (left) KNOM spiritual director Fr. Mark Hoelsken, SJ visits assistant program director Kelly Brabec (BRAY-beck) during her afternoon shift in Studio A, the station�s primary live studio. The audio mixing console in front of Kelly was given to KNOM by the Koch Foundation ten years ago. It works as reliably now as it did then. GIVING CREDIT: By far, most of our contributors prefer to give by check, which is the easiest way for us to receive a gift. We are also happy to offer our donors the option of donating by major credit card, and donating automatically each month, if you like. We are sincerely grateful for your support. Individual gifts from generous people like you provide 95.1% of our mission�s income. Thank you! GETTING THE L.E.D. OUT: We�ve spoken with engineers from Honeywell, which manufactures a tower beacon of L.E.D.�s (light-emitting diodes). Cost of the beacon, and lamp assemblies for the side of our tower, will total about $3,400 delivered to Nome. We are still working on an estimate for the cost of a tower crew to install the lights, which will replace our corroding 33-year-old tower lamp bases. Thanks to lowered power consumption, the L.E.D. beacons will save our mission as much as $30,000 over ten years. We�ll have the final cost estimate to you next month. 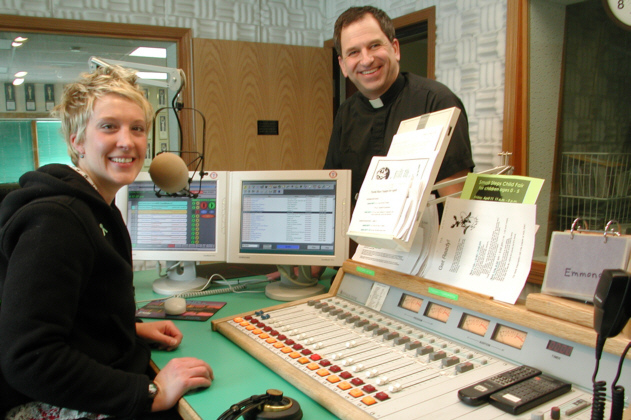 Founded July 14, 1971, KNOM is the oldest Catholic radio station in the United States. We beam into dozens of isolated Eskimo and Athabascan Indian villages 24 hours a day, thanks to you. INSPIRATIONAL SPOT: Those who bring sunshine to the lives of others cannot keep it from themselves. top FAREWELL: (left) We bid a sad goodbye to KNOM development assistant Connie Albers, posing here with children William and Josephine. Originally from Milwaukee, WI Connie came to KNOM as a volunteer in 1997. After she served two hardworking volunteer years, the station hired her to help process mail, pay bills and organize correspondence with our donors. Connie, husband John (who was a 1992-3 KNOM volunteer) and the children moved from bush Nome to Alaska�s second largest city of Fairbanks May 1st. As you can imagine, we will greatly miss her, though we know that she and John will remain in touch. Please join us in praying for continued blessings for Connie and her family! ON THE AIR -- AND IN THE AIR: KNOM volunteer Emily Barrett returned home with many tales of a visit to the remote village of Gambell on St. Lawrence Island, just 35 miles from the Russian mainland. The Gambell folks were celebrating their spring �Yupik Days� festival, with elder storytelling, model making of ancient boats and hunting tools, traditional endurance sports such as the �knuckle hop,� a potluck dinner, and a fashion show featuring families and children in old-time Eskimo clothing. One activity was the blanket toss, a game based upon a hunting tool of the past. About twenty people hold a heavy, large walrus skin, from which they catapult a person upward, as from a trampoline. On the wobbly skin, �I couldn�t stand up because I was too nervous,� Emily says, though after two flights upward, she was ready for more. Covering the event for KNOM, Emily was warmly welcomed. Except for the village�s teachers, she was the only non-Siberian Yupik (Eskimo) individual in town for the festivities. INSPIRATIONAL SPOT: Our gift of sight is unquestionably important. We should also know how important is the gift of vision, which allows us to see what is beyond our sight. INSPIRATIONAL SPOT: Let�s not waste our time trying to be better than those around us. Let�s just try to be better than we ourselves were yesterday. 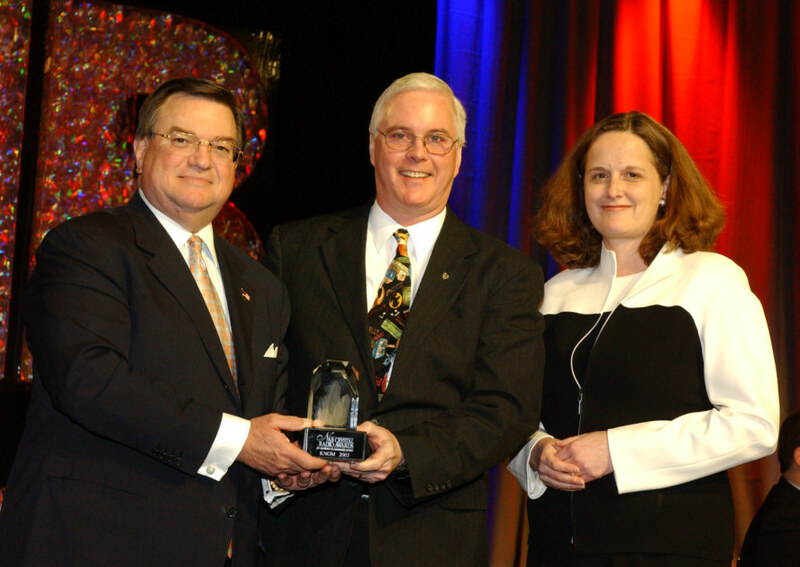 top CRYSTAL CLEAR (left): KNOM general manager Tom Busch, center, accepts the station�s 2003 Crystal Award for Excellence in Community Service from National Association of Broadcasters president/CEO Eddie Fritts and Radio board chair Virginia Morris. The award was presented in Las Vegas April 8th before an audience of about 1,500 broadcast executives. There�s no official word, but it�s believed that over 1,200 radio stations were in competition for the award. Ten stations have received this top national honor each year since its inception in 1987. It�s KNOM�s third Crystal, having won in 1987 and 2000. EASTER TREAT: In April, Nome�s St. Joseph parish was greatly enriched by the visit of retired Bishop Paul Dudley. Bishop Dudley, who administered the Diocese of Sioux Falls between 1978 and 1995, celebrated KNOM�s broadcast Passion Sunday and Easter Masses, and services during Holy Week. He made many friends during his brief time here. WILLFULLY: Please consider remembering missions like KNOM in your will. For most of us, it will be our largest gift by far. At KNOM, we place all bequests into funds that provide for future major improvements and protect the mission in the event of unforeseen emergencies. Some Christians are like wheel barrows -- no good unless they�re pushed. Some are like kites -- if you don�t keep a string on them, they fly away. Some are like footballs -- you can�t tell which way they will bounce next. Some are like neon lights -- they turn on and off. And some are like a good watch: open face, pure gold, quietly busy and full of good works. The sight of every dirty sock on the floor would be a blessing, if you were blind. Being able to mop the floor would be a blessing, if you were confined to a wheelchair; paying the bills would be a blessing, if you were unable to move your hands. You can make every chore a prayer for someone who can�t complain about having to put up with them. top WATT�S THAT? 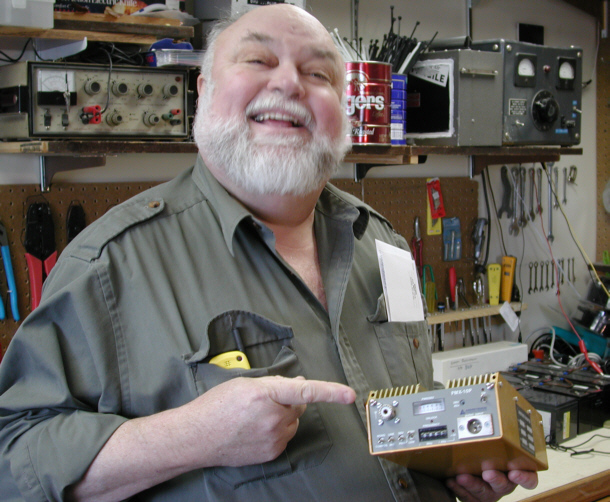 (left) It�s a complete 10-Watt FM broadcast transmitter, a happy KNOM engineer Les Brown notes. We�ve purchased this one to test for village translator use. At $1,200, it�s one-third the cost of larger transmitters we had been considering. KNOM�s applications for 13 village translators are pending. According to consulting engineer Jack Mullaney, it may be a year or more before the FCC grants permission to build. THIRTY YEARS AGO: May 1973: After 40 months, founding KNOM volunteer engineer Tom Busch departed KNOM, returning to commercial radio in Fairbanks, �never to return,� according to his recollection. He was replaced by fellow broadcast engineer Roy Wells, from New Mexico. Tom actually did come back several times to help with transmitter cleaning and maintenance, and two years later, returned as general manager. 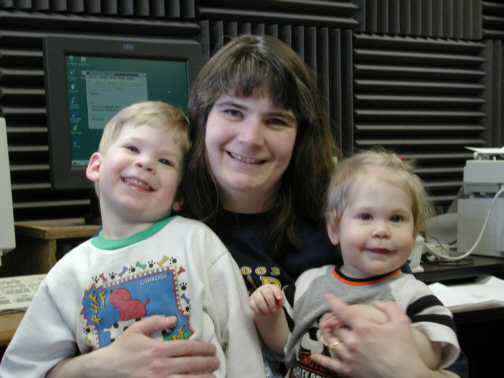 TEN YEARS AGO: May 17, 1993 at 5:53 AM, KNOM signed on for the first time from its brand new studios, the Keller Broadcast Center, thanks to $450,000 in special gifts, including a $100,000 grant from the Keller Foundation. That moment, local KNOM-FM signed on in high-fidelity stereo. 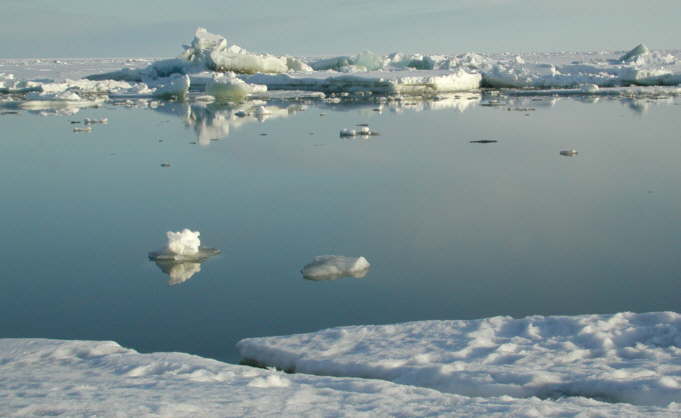 GOING WITH THE �FLOE�: (left) April 22nd, Nome�s ocean ice cracked, broke up and drifted from shore. Within a few days, however, it was back! Final �breakup,� as it�s called, won�t occur for another month. WE THANK YOU ONCE more for your helping hand, and for your prayers. God bless you!